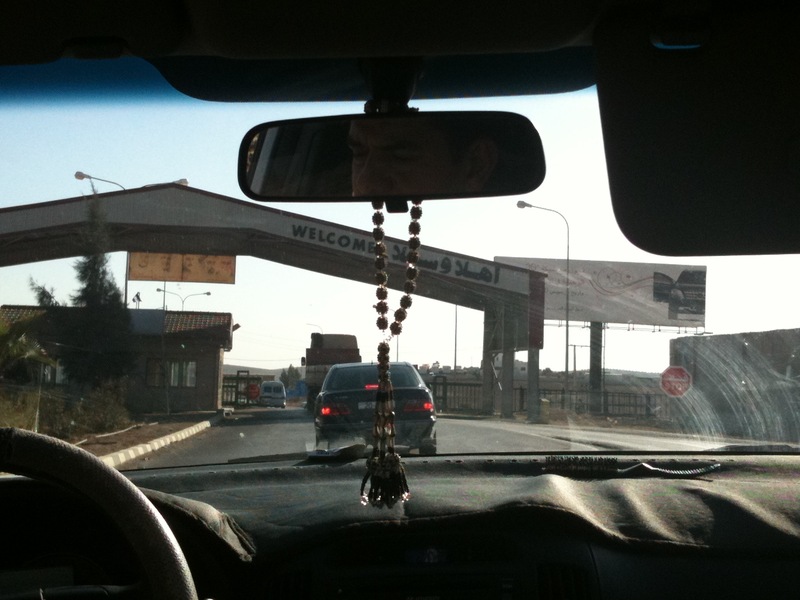 I left Damascus in the morning, sharing a taxi with an Iraqi dentist who lived in Texas, a teenage boy from Daraa, and an old woman whose hands were permanently dyed indigo from years of clothes making. "Why did you come to Syria? It is an odd place for an American to visit." The dentist asks. "I wanted to see." I reply. The driver stops at a popular and cavernous Duty Free about a mile from the Jordanian border. Bottles of Chanel perfume, Calvin Klein cologne, and Johnny Walker labels of all colors sparkle under spotlights. The typical liquor, chocolate, perfume, and cigarette shopping mall stocked with more foreign goods than I had seen anywhere in the country, located miles from the nearest town. The driver purchases all the cigarette cartons he can carry, shoving them under the seats and beneath the spare tire in the trunk. Reaching central Amman, the cartons are promptly unloaded and exchanged for cash. I wish to pass through the disjointed capital quickly as I will return in a few days. The dentist directs me to a bus office and we part ways. It's nearly midnight by the time the bus arrives in Aqaba; the ride from Amman a blur through the darkness along King's Highway, punctuated occasionally by the blazing florescent lights of a gas station. The bus is nearly empty, half a dozen other single men doze as an Adel Emam film plays overhead. I can't sleep and flip through a guidebook about Petra, the Nabataean city carved into the mountains deep in the Jordanian desert. Aqaba is located in a special economic zone in the south of the country, on the tip of the Red Sea where Egypt, Israel, Jordan, and Saudi Arabia all meet. Petra lies about an hour and a half to the north, a popular excursion for tourists staying in Jerusalem. 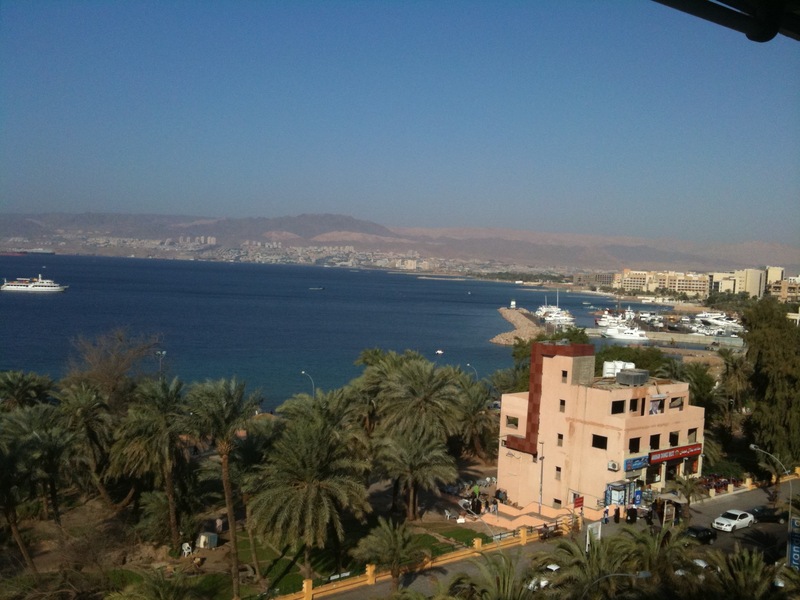 The town of Eilat glimmers just across the sea, a short swim away. 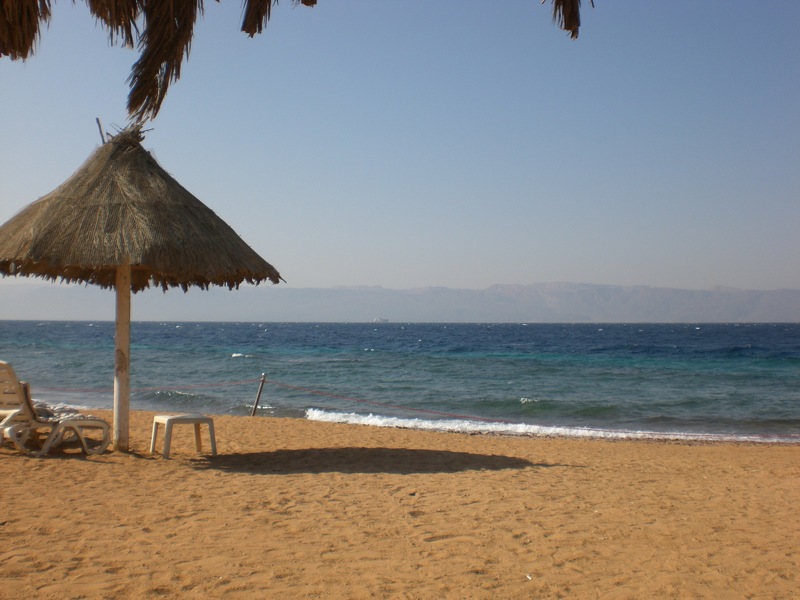 Though Aqaba caters to the flocks of Saudi tourists who come to enjoy a relaxation of laws and customs, a beach town for burqas. The central part of town hasn't seen a building boom since the late 1970s. The main boulevard runs along the sea with buildings reminiscent of the English mandate period overlooking the beach. I pick a hotel on the corner, the lobby an empty expanse of cheap marble covered in years of dust with a threadbare pair of sofas tossed by the windows. The balcony of my room looks out onto the sea, a black mass on this moonless night. Though cars are few, the beach bustles with hundreds of people clustered together in groups sharing a single hookah. They are scattered in circles among an assorted rainbow of plastic chairs. Arab pop music and Radio Ibiza mixes with the calmly lapping waves as curls of smoke waft up into the sky. Most of the men wear jeans and t-shirts, the women covered in folds of fabric. Children run about, taking in the freedom of the evening as their parent's chat and smoke. After a walk along the beach I turn back towards the city center. The streets are empty. I come upon a large florescent sign advertising "Chinese-Arab Massage" and decide to enter. The massage parlor is up three flights of stairs in a non-descript office building. I enter the open door and walk into a dimly lit room. A muscular Arab guy sits behind a desk and glances up from his newspaper. He looks at me for a moment, and then asks, "Massage?" I nod my head in agreement. "Chinese or Arab?" he asks. I glance around the room and notice a dozen women, some Chinese, some Arab, sitting on sofas along the wall, their faces vacant with boredom. I shrug my shoulders and ask if there are any men available. The man looks at me for a moment, and then says no, just women. I ask the difference between a Chinese and Arab massage, he responds that Chinese are half the price. That settled, I am lead into a curtained off room in the back. After stripping down to my boxers I lie face down on the table and wait. My masseuse arrives, oils up my back, and then proceeds to lightly push on me with her fingers. Hardly what I would call a massage, but I think perhaps it will get better. She taps me on the shoulder and motions with her hands for me to flip on my back, stomach up. I do and she lightly caresses the hair on my chest. I become uncomfortable. Sensing that I am not enjoying this, she motions at my boxers. I cast her a look that could only be interpreted as, don't you dare. Yet, she lifts up the waistband of my shorts. I push her away and slide off the table. She is stunned, confused, and refuses to give up. After trying unsuccessfully twice more to grab me, she leaves the room. I start to dress, assuming this entire experience is over, only to have the head matron come in and berate me for refusing the services of her employee. They both push me towards the table, but I shove them aside and run to the man at the front desk. "Did you enjoy?" he asks. "No," I reply, "I want a man!" I throw down $20 on the table and run down the stairs. Before I can reach the street, a man grabs me from behind. "You want a man, yes?" he asks. He had been sitting on the sofa behind the man at the desk and observed all that transpired. "I will show you a real man," he says, rubbing his corpulent belly. I am mortified at the prospect, but calmly decline his advances. "It is okay, I will drive to your hotel." "No," I say, "it is close. I will walk." I turn and run down the street, not stopping until I reach the hotel. The next day I take a bus further south to the slew of high-end resorts, near the Saudi border, that remain popular with vacationing Europeans. Secluded, clean, and safely ensconced within a security compound, these resorts feature private beaches that stretch out into the Red Sea. Like so many other countless imitations, these compounds could not be more out of place, and out of touch, with the communities that lie just outside the iron gates. There are no happy endings here; skin diving, snorkeling, and drinking cocktails poolside are the main events at these shells of touristic humanity. I swim out into the sea and stare at the mountains of the Sinai rising up across the water. The water is crystal clear, the sky a hazy blue. To the north, Aqaba and Eliat look as though they are one city set against a backdrop of natural beauty that cares not for the invisible borders created by treaties. I lie on my back and float out into the sea, the shore slowly receding as the waves take me where they wish, a reminder that nature remains ignorant of our human despair.